Writer/Director Jennifer Westcott did what all first-time feature directors are encouraged to do; make a film set in one location, and fund it on Kickstarter. She deserves praise for pulling it off. Making a movie, any movie, is tough. And 'Locked in a Garage Band' is a well put together film. The director had a vision, a story, and delivered it. But the script has major flaws. We moan that the scripts for studio movies get meddled with too much. The problem with crowd-funded movies is that there's rarely anyone on quality control. We all like to think we're capable of writing a genius screenplay straight out of the park, but few of us are Woody Allen. 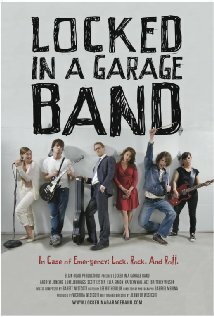 The film's main flaw is that, due to the title, we know it's about a band who get locked in a garage. But the film takes 30 minutes to get there! When the audience knows the answer already, you can't hold it back from the audience, you're wasting their time. The set-up was a pretty standard one. A bunch of white friends in the suburbs have a few disagreements and relationship issues, which make people leave the band, join the band, etc etc... and then they all come together in a garage, and are accidentally locked in for the day. ..But it doesn't happen. The laughs don't come, because the stakes aren't big enough. The friends are stuck in a room together and many of them dislike each other due to misunderstandings and disagreements. And one of the guys is annoyed because he had an interview to get to. But it's not enough! So what if the friend group is fractured? Most groups of friends are! And the guy has an interview? Who cares! Reschedule it. The concept had so much potential - but it needed more conflict! One of them could have been claustrophobic, another with a deadline for an exam which will change his life, the other's dying grandmother waiting to be picked up at the airport--- the stakes need to be giants! That's why the film is much weaker than it could have been. The being locked in is not a big punishment for these, it's not a big thing to overcome; you don't feel anyone is truly suffering. That's why the ending, when they all suddenly learn life lessons, is so unbelievable. Even in a light comedy, you can afford to raise the game; have characters who are desperate, who are in jeopardy. But hey, they funded it on Kickstarter, and shot it in 10 days. And for that, they should be applauded. The performances are good, the cinematography does the job; and the editing is top notch. That's a different movie you wanna see Kid. A Hollywood movie with a bunch of unrealistic incidental improbabilities all baked into a group of youngsters who ALL face real serious challenges and are all insanely and ironically desperate to get out on that very same afternoon. No, thankfully we weren't subjected to THAT story. This story is a slow lazy afternoon story whose only highlight is a small town gathering they all missed and didn't care about anyway. Thankfully we were gifted with an opportunity to watch kids be kids and recall what it was like when seemingly massive problems of epic proportions now pale in comparison now that we're all grown up, because a dying grandmother isn't all that comedic in my book. Thanks for reminding me what Hollywood coulda shoulda woulda done. We've already scene that story too many times over. Oh, and that claustrophobic band member you were hoping to meet would have NEVER joined a garage band to begin with. You're a bit presumptious there - I don't want to see a Hollywood movie. This is just the type of movie I like and support -- but it just didn't have enough to hold my interest throughout, personally. Sure, the dying Grandmother might not be funny, was just throwing it out there as an example, I didn't put a lot of thought into it -- I'm not re-writing the movie, just explaining a point! I didn't buy into their problems, it didn't resonate personally. And believe me, an indie film about teens in a band stuck in one place is usually exactly the kind of thing I relate to! I just felt it needed more. It has nothing to do with Hollywood. I spend most of my time frustrated with Hollywood. Don't mean to be so disagreeable! Just think we feel a bit differently about this one, but thanks for your views! Great achievement getting it made - you must be proud of being involved in it. Also saw you're involved with 'How Do You Write a Joe Schermann Song' which I've heard GREAT things about, but unfortunately didn't get to see at the festival!